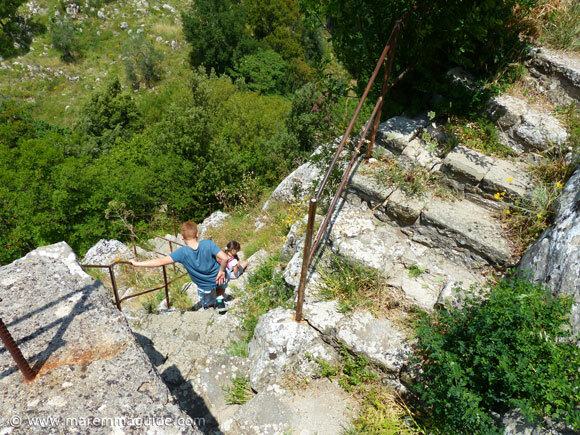 Rocca Aldobrandesca in Roccalbegna: "I'm the king of the castle..."
Your first glimpse of the Rocca Aldobrandesca in Roccalbegna will take your breath away. Have you beseeching the driver of your car - if that isn't you - to stop so that you can take a photograph. And fill you with excited anticipation of exploring it and its colourful town below. 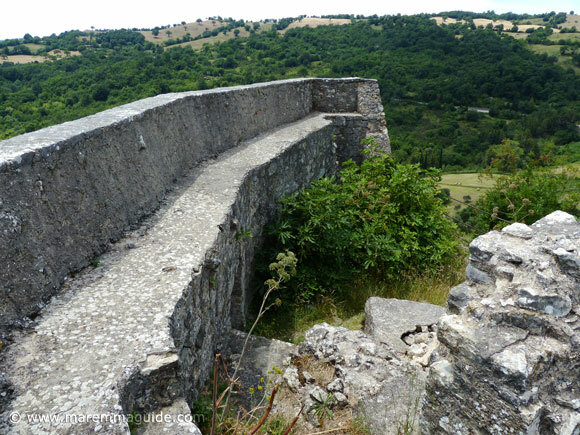 Whilst nearly every medieval castle, tower, or fortress I have reconnoitered in Maremma - and there are a lot - is strategically positioned overlooking the local terrain, la Rocca Aldobrandesca in Roccalbegna is different. Not because it wasn't built on the highest point; it so obviously was. But because the "sasso" on which it is built and from which it takes it's local name of "Il Sasso" or La Pietra" (both meaning stone in Italian), only had room for the fortress and nothing else. Two, tight levels of nothing else of irregular in shape, following as it had to, the topography of its rock. "I'm the king of the castle. And you're the dirty rascal." must have been sat looking at "La Rocca" when they did so. A stunning location and a stunning view from its ramparts, but only for those few who lived within its walls. The rest lived down below, within the walled town for which it kept look out. There is a signpost, but it isn't a big thing. Just a matter of fact sign to the "La Rocca". If in doubt, you need to walk up the single-lane road - called Via Salita Sasso - that starts from the bar in the centre of town. Past the first of the two thirteenth medieval towers within the city walls on your left. The lane is the one you can see next to the white car in this photograph. You can walk down the narrow street on the other side of the tower, within the city walls, from the next street on just past the bar. Bear right and then follow the track - it curves left - up and up. 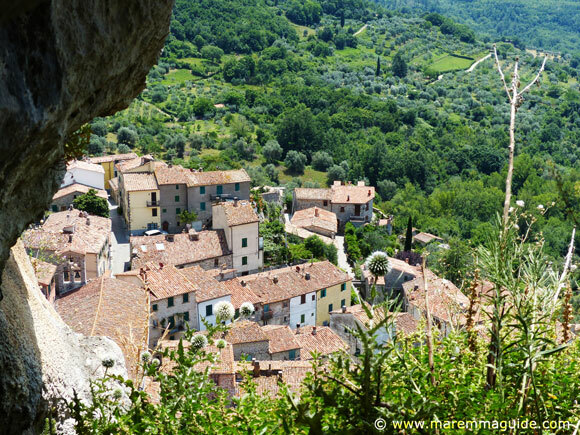 The view of Roccalbegna on your left as you climb. Keep going up. 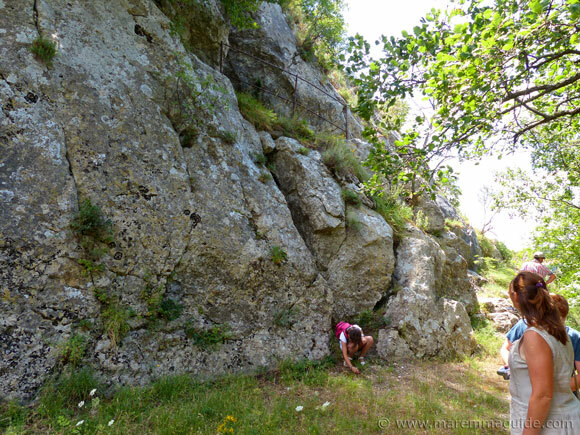 Until you reach the base of the "Sasso". Photographing wild flowers at the base of "Il Sasso". From here there are steps up its side. They look worse than they are: the steps are uneven, but easy going and perfectly fine for children. They will most likely end up waiting for you! This is us on the way down. 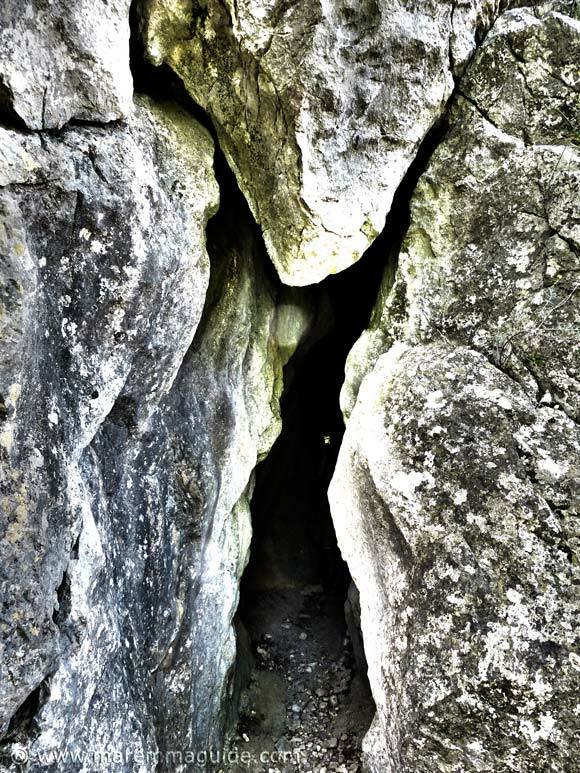 You'll come to a point, about half way up, where you will spot a cave like entrance on your right. Go in! I mean it: don't walk past. Daylight floods in from the other end too, so there is sufficient light to find your way. I know I worry too much, but one day that triangular shaped rock that is above the entrance is going to fall. The view from the other end of the cave. The way back out. You'll need to bend over a bit! The view from the top of "la Rocca"
When you get to the top of the Rocca, the view is nothing less than stupendous. Most of the images of the town of Roccalbegna have been taken from here; and why not when it looks like this. A little note for mums with little ones. This is the wall at the top of the Rocca. There isn't a rail to stop any avid climber from going over, nor one to prevent a mis-step backwards. 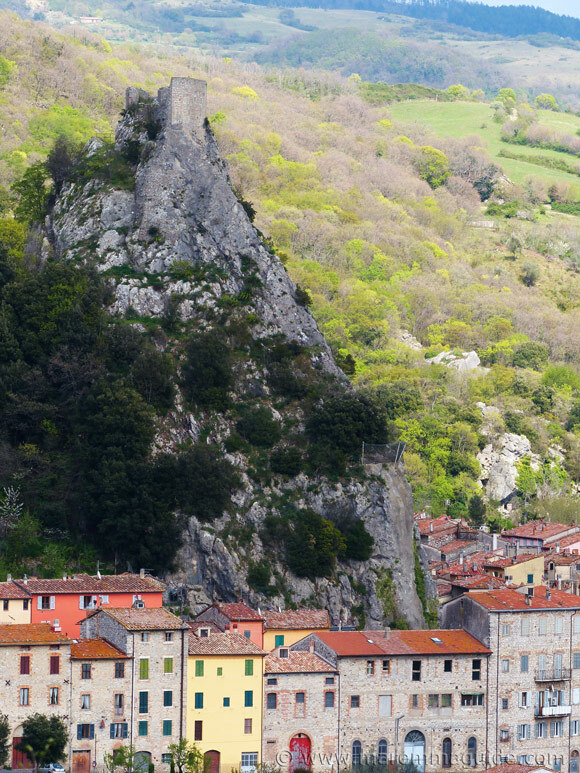 The view of "la Rocca" from the "Cassero Senese" (Sienese Keep) on the hill on the other side of Roccalbegna. The "Sasso" is sixty metres high. 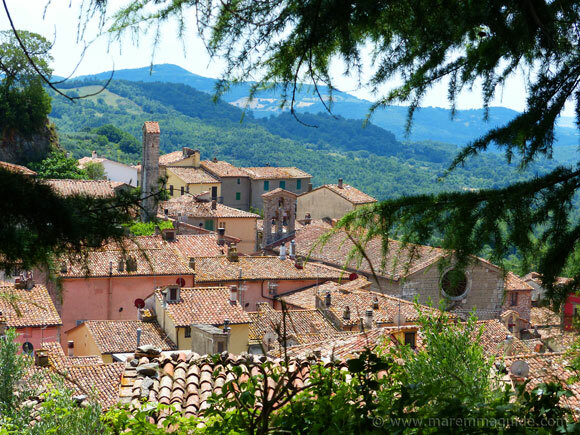 Although it may be hard to believe it today when you walk through this ever so quiet town, the road through Roccalbegna has always been one of the principal routes across this part of Maremma, in Monte Amiata territory. 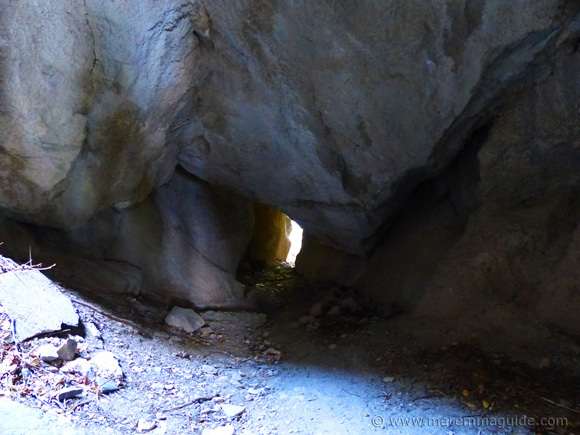 And here the passage narrowed: between "il Sasso" and the rocky outcrop opposite that you can see in the photograph below. The Cassero Senese and the Rocca Aldobrandesca. 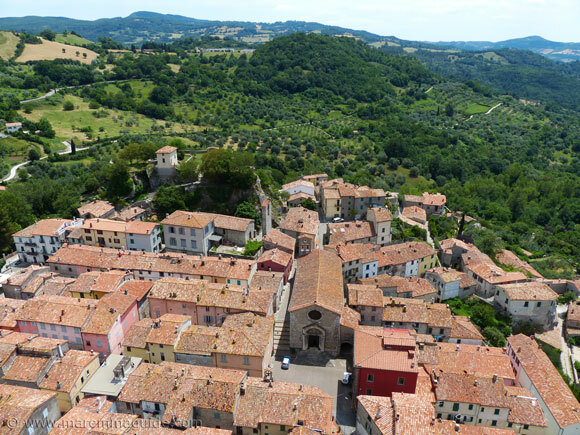 It made for a strategic location to control traffic through Monte Amiata, which is just what the ruling medieval family in the thirteenth century, the Aldobrandeschi family, decided to do. When, by the end of the twelfth century they had, by fair means and foul, acquired control over nearly all of Maremma. Including, by the year 1216, Roccalbegna. Roccalbegna's "castello" (castle), the fulcrum of activity in the city, was already built when the Aldobrandeschi arrived and positioned their barons as rulers of the city and its lands. 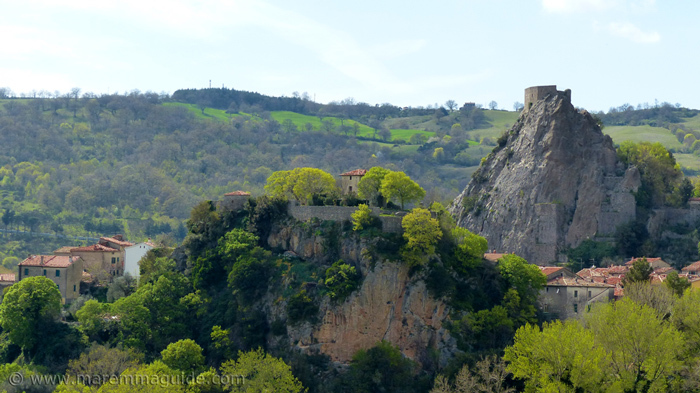 But it was more of a fort than a castle and it wasn't the "Rocca", it was another. Built on the lower of the two outcrops, on the site of what is now the remains of the "Cassero Senese". 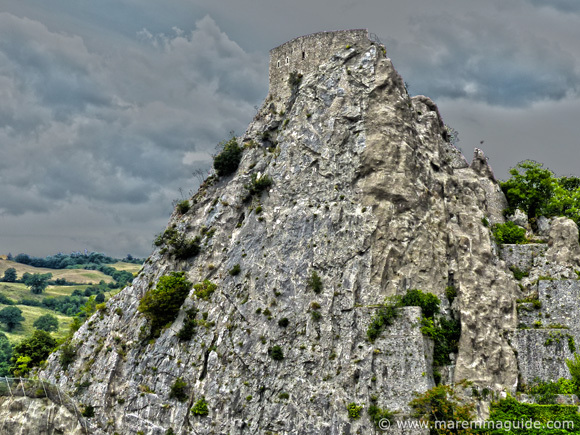 The Rocca Aldobrandesca was then referred to as the "Pietra d'Albegna" and wasn't built as a castle or fortress to be lived in. It was as a look-out tower and last retreat for the population of Roccalbegna should the town's defences be breached. It become known as the Rocca Aldobrandesca after a few years of Aldobrandeschi rule. 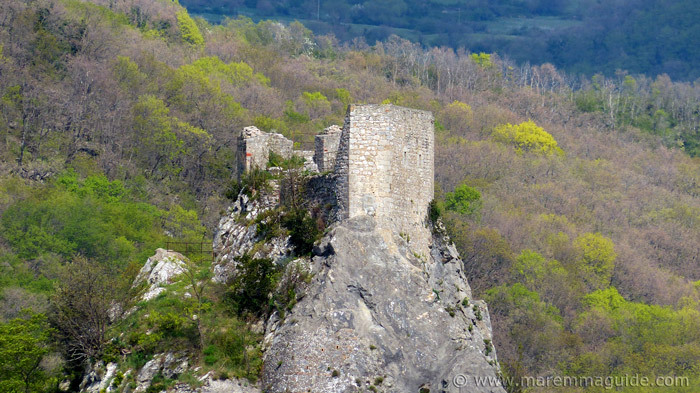 But others had eyes on Roccalbegna and its fortresses. The Repubblica di Siena wanted Maremma: its mines made men rich and fed and paid armies. The city advanced its political expansion into Maremma territory, sacking with militia or buying as many lands and castles as they could. But the Aldobrandeschi were having none of it and the thirteenth century saw witness to many clashes between them and the City of Siena. But despite Siena's considerable resources and success around them, the Aldobrandeschi managed to retain hold of their properties. Including Roccalbegna. It wasn't to last. By 1261, amongst the various terms laid out by the Republic of Siena that the Aldobrandeschi had in subsequent years had had to agree to, was the requirement that their occupier of Roccalbegna submit to the commandment of Siena, or its armies would arrive and enforce the orders. Bloodily. Siena interfered a lot in the life of the barons and men of Roccalbegna, who, notwithstanding the orders, held fast for a long time with their allegiance and support of the Aldobrandeschi family. But by 1282, the then vassals of Roccalbegna, the Ugolino family, with the intent of freeing their family from their feudal relationship with the Aldobrandeschi, squarely aligned themselves with the republic of Siena. From then on, Roccalbegna was lost. 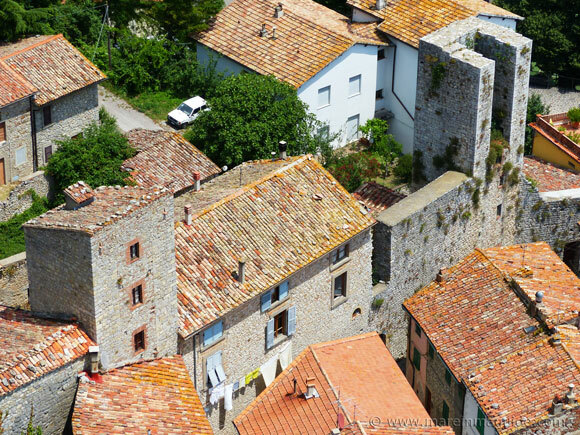 Five years later in 1287, they borrowed money from the Republic for the restoration of Roccalbegna's city walls. Six years after that in 1293, they gave Siena a quarter of the ownership of the castle and its lands for more money. That same year and just a few months later into the next, Siena brought two more shares. Six months later another share was given up by the Ugolini. So strategically placed was Roccalbegna to Siena in its feud with the Aldobrandeschi, they went full out to acquire the remaining controlling share, and did so in 1296 for a considerable sum of money. But Venico di Ugolino received substantially less than the agreed sum of eight thousand four hundred and twenty-eight lire, because before handing over the purse, Siena deducted his debts. Roccalbegna and the Rocca Aldobrandesca were now Siena's. The Republic of Siena immediately went about restoring the Cassero. Built new city walls, with integral look-out towers, that connected the Cassero and the Rocca. And drew-up an urban plan for the city within them. But that isn't the end of the tale of the Rocca. With Roccalbegna now belonging to Siena, open war was declared between the two parties, and in 1314 the Aldobrandeschi took the Cassero with force, sacked and burned the city. The walls and castle were badly damaged. Only two parts of the wall, one entrance "porta", and two towers remain standing today. And you can walk alongside and through them just as the men and women of this important outpost did seven centuries ago. Touch the same stones that they did... and imagine what life was like in this outpost. 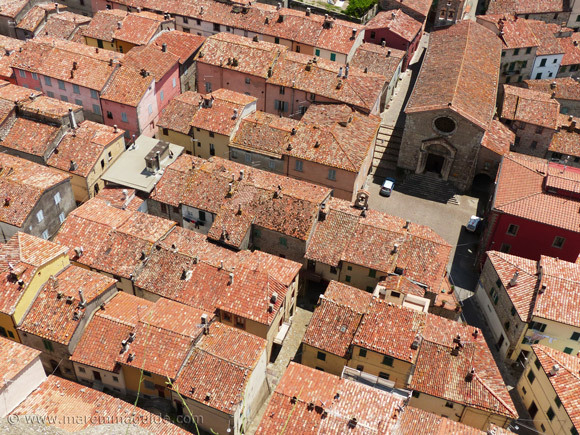 It isn't hard to do as Roccalbegna's streets within its centre are still exactly those that were there all that time ago. By 1318, Siena had other more pressing fights to attend to and, cash-strapped, decided to sell Roccalbegna to the other Maremma nobility, the Piccolomini family, for a lot of gold: seventeen thousand four hundred and fifty gold florins to be precise. But immediately regretted it, and rented it back from the Piccolomini. I don't know how, but by 1324 they Republic owned it again. Less than thirty years later, Siena no longer considered the Rocca to be of strategic importance and ceased maintaining it. In 1352 it was once again attacked by the Aldobrandeschi family, this time by one Andrea Aldobrandeschi of Santa Fiora. And then it seems in turn by all in sundry of local tyrants and nobility. Between raids by outlaws, bandits and gentry with aspirations, Roccalbegna was no longer a safe place to live.